Brookline, MA – Following a comprehensive search process that began in October 2014, the Board of Trustees of Hellenic College and Holy Cross Greek Orthodox School of Theology (HCHC) voted unanimously to elect the V. Rev. Fr. Christopher T. Metropulos as the next president of the institution, in succession of the current president, the V. Rev. Fr. Nicholas C. Triantafilou, who after a fifteen-year tenure will retire at the end of June 2015. Fr. Metropulos has been serving as the Senior Pastor of St. Demetrios Greek Orthodox Church in Fort Lauderdale, Florida, since 1989. He holds a BA from Hellenic College, a Master of Divinity from Holy Cross Greek Orthodox School of Theology, and a Doctor of Ministry from Pittsburgh Theological Seminary. Fr. Metropulos founded and has successfully directed OCN (Orthodox Christian Network, a radio and internet ministry) and is currently its Executive Director. He has served as Dean of Admissions at HCHC, and thereafter in varying priestly capacities with the Archdiocese, including: Archdiocesan Representative to the UN and US Missions, Archdiocesan Council, Assistant Regional Director of Leadership 100, and President of the Archdiocesan Presbyter’s Council for two consecutive terms. Fr. Metropulos also served the parishes of St. Demetrios Cathedral, Astoria, NY; Archangel Michael, Port Washington, NY; and the Assumption Cathedral, Denver, Co. In addition to being a Protopresbyter of the Greek Orthodox Archdiocese of America, he is also Protopresbyter of the Ecumenical Throne. After a thorough review of a deep pool of dynamic candidates, the Hellenic College Holy Cross Presidential Search Committee interviewed 22 individuals. The list was narrowed to eight candidates who qualified as semi-finalists. At the end of March, each of the eight semi-finalists participated in extensive off-campus interviews conducted by all members of the Committee.In April, the two selected finalists were introduced to a broad cross-section of all constituencies of Hellenic College Holy Cross. The candidates met with His Eminence Archbishop Demetrios of America, Chairman of the Board of Trustees. There was a full briefing and discussion on the progress of the election of the new President for Hellenic College Holy Cross School of Theology with the Eparchial Synod, Faculty members from both schools, Senior Administrators, The Executive Committee of the Board of Trustees, and representatives from the student body, Alumni Association, Archdiocesan Presbyters Council, Philoptochos, Leadership 100, and Faith Endowment. “The final decision was a difficult one, as our search came down to two extremely qualified finalists. Both candidates exhibited exceptional administrative experience and demonstrated an astute understanding of the critical mission of our school,” stated Dr. Thomas C. Lelon, Chairman of the Presidential Search Committee and Vice Chairman of the Board of Trustees. “Finding a new president at this particular time was challenging indeed, due to the remarkable accomplishments and tenure of our retiring President, Fr. Triantafilou, who has become the longest running president in the history of HCHC,” added Dr. Lelon. On Friday, May 1, 2015, the Board of Trustees at a special meeting and after a thorough consideration of the unanimous nomination of both the Presidential Search Committee and the Executive Committee, unanimously elected Fr. Metropulos as the next president of HCHC. Fr. 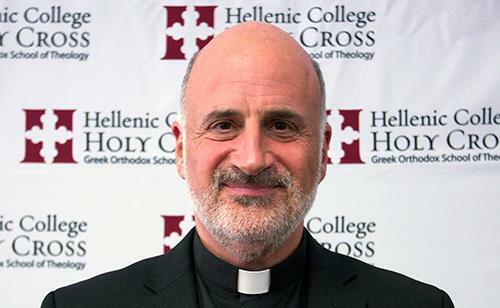 Metropulos will be formally inaugurated as the 21st president of Hellenic College and Holy Cross Greek Orthodox School of Theology on September 14. Hellenic College Holy Cross is the intellectual, educational, and spiritual center of the Greek Orthodox Church in America. Hellenic College is the only fully accredited, four-year Orthodox Christian college in America. Holy Cross Greek Orthodox School of Theology, founded in 1937 is the oldest and largest Orthodox Christian school of theology in America. The mission of both schools is the formation and education of faithful within the life of the Orthodox Christian community. Hellenic College Holy Cross is situated on a 52-acre campus overlooking downtown Boston.